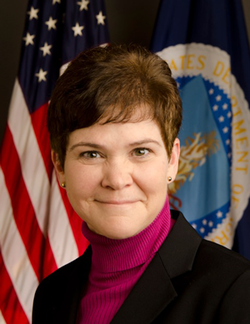 (Stoneville) --- Deputy Secretary of Agriculture, Krysta Harden, will be the Featured Guest and Keynote Speaker for the 79th Annual Meeting of Delta Council to be held on the Delta State University Campus at 10:30 am, Friday, May 30, 2014, at the Bologna Performing Arts Center in Cleveland. Harden, who was raised in South Georgia in a farming family, was sworn in last year as Deputy Secretary after a distinguished career in many areas of agricultural policy. “We are so pleased that our friend, Krysta Harden, will be the featured speaker for this year's Delta Council Annual Meeting," said Delta Council President Gibb Steele of Greenville, a farmer. "We have worked with Krysta in a number of different capacities during her career, including her distinguished tenure as CEO of the National Association of Conservation Districts, the American Soybean Association, and as staff person on Capitol Hill concentrating on agricultural issues. Secretary Harden has distinguished herself over the last 5 years at the Department of Agriculture, serving as Chief of Staff to the Secretary and Assistant Secretary for Congressional Relations. Since being nominated as Deputy Secretary, she has already been charged with implementation of the 2014 Farm Bill over the coming months, and we look forward to her talking to our members and guests about the future of Rural America." Harden was instrumental in implementing programs under the 2008 Farm Bill that have resulted in record investments in America's farms and rural communities, record agricultural exports and record conservation efforts. Harden worked to pass and implement the Healthy, Hunger-Free Kids Act of 2010, ensuring the availability of nutrition assistance to struggling Americans. A chief advocate of conservation, Harden continues leading efforts to build close stakeholder relationships with an ultimate goal of enhancing land and water conservation, improving economic opportunities through increased outdoor activities and expanding modern forest management. From 2004 to 2009, Harden was the Chief Executive Officer of the National Association of Conservation Districts. She worked with the American Soybean Association as Senior Vice President of Gordley Associates from 1993 to 2004 where she concentrated on conservation and renewable energy issues. She also served 12 years on Capitol Hill, as Staff Director for the House subcommittee on Peanuts and Tobacco and as Chief of Staff and Press Secretary for former Congressman Charles Hatcher. Harden received her B.A. in Journalism from the University of Georgia. Mississippi Governor Phil Bryant, will introduce Secretary Harden to the Delta Council audience. In addition to the Keynote by Secretary Harden, Delta Council will honor more than 140 high school seniors as Delta Honor Graduates with the ceremony beginning at 9:00 a.m., located ‘under the tent in the parking lot’ next to the Bologna Performing Arts Center. Dignitaries will welcome the Honor Graduates, their families, and school officials, to the Annual Meeting of Delta Council and present them with engraved certificates recognizing them as 2014 Honor Graduates. The top Honor Graduate will be selected by higher education officials and be presented a $2,500 scholarship during the 10:30 a.m. business session. “The Delta Honor Graduate event is designed to raise the level of awareness of parents, teachers, and our local communities of the importance of bringing these bright young minds back to the Delta after they have completed their formal and advanced education,” stated Cass Pennington of Indianola, who serves as Chairman of the Delta Council Education and Health Policy Committee. Also, at 9 a.m. in the McPherson Recital Hall inside the BPAC, noted Washington political commentator Stu Rothenberg, a favorite of past Delta Council audiences, will address the members of Delta 1000 on the upcoming midterm national elections. The tradition of a fried catfish luncheon will conclude the program for the 79th annual event on the grounds of the Quadrangle on the Delta State University Campus. Sponsors for the 79th Annual Meeting include; BankPlus, Catfish Farmers of Mississippi, Cotton, Inc., Jimmy Sanders, Inc., Mississippi Corn Promotion Board, Mississippi Rice Promotion Board, Mississippi Soybean Promotion Board, and Southern Ag Credit/Mississippi Land Bank.